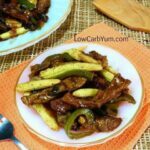 A quick and easy pepper steak low carb beef stir fry dinner with optional baby corn. It’s a simple meal that great for busy weeknights. I’m back on the road this week and next so my blog posts are limited. I did make dinner in the hotel the other night with some sirloin steaks and vegetables. 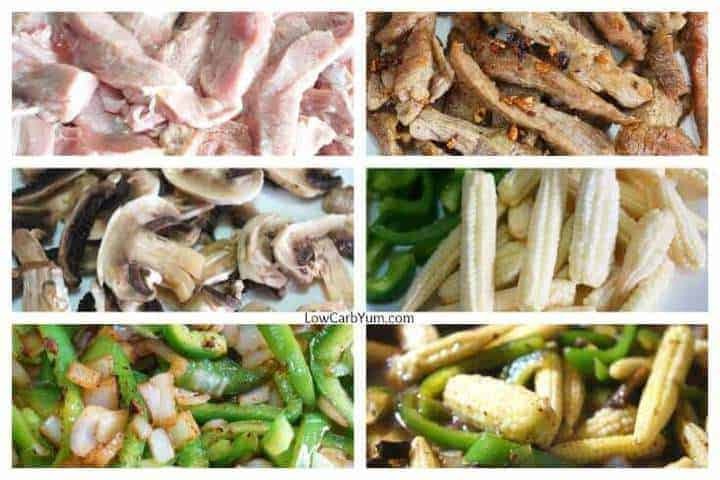 I usually make my pepper steak with just sliced green pepper and onion stir fried with some soy sauce and seasoning. 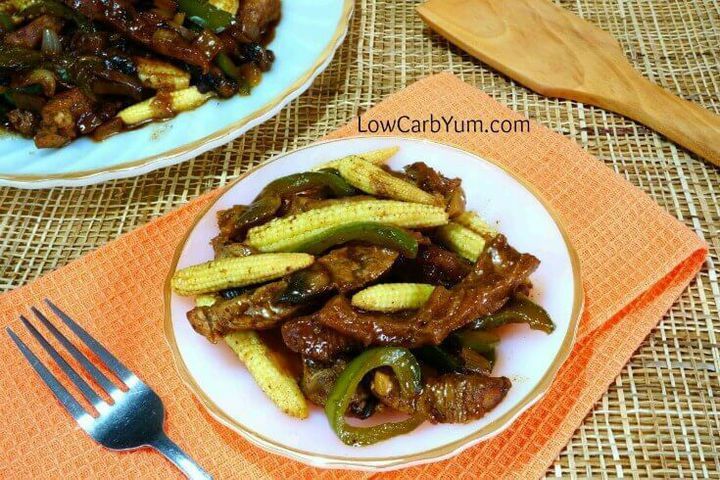 This time, I added a can of baby corn to the low carb beef stir fry. The whole can only has 10 grams of carbs, 6 of which is fiber so the net carb is only 4g. I never realized this was such a low carb vegetable. Corn is very high on the glycemic index, but the smaller version is extremely low because it is mostly fiber. I’ve seen a few recipes for low carb corn bread using baby corn and I’ve been meaning to try that, but lately I haven’t had a lot of time for cooking. When things slow down a little, I’ll start working on that list of recipes to try. UPDATE: I made some coconut flour bread with baby corn. 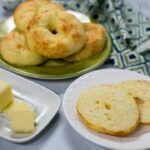 The low carb corn bread recipe with baby corn is available here. A lot of low carb eaters may shy away from eating any type of corn. There is the concern of GMOs, and I am against genetically modifying plants so excess chemicals can be used on them. However, it is possible to buy non-GMO baby corn. 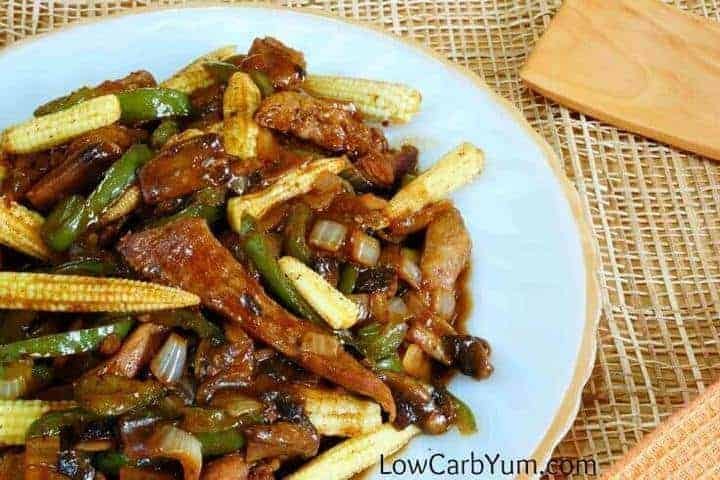 You can always leave the baby corn out of the low carb pepper steak recipe if stay away from corn. 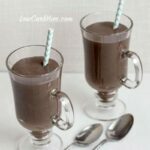 Another low carb vegetable could be used in it’s place. Or, you could add in some red or yellow peppers to replace it. 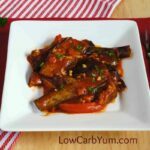 This low carb beef stir fry recipe is super easy to customize to your liking. In fact, you can even replace the pepper with a low carb veggie like broccoli. Of course, it wouldn’t be pepper steak any more. Although not needed, I like to add a bit of cauliflower rice on the side. 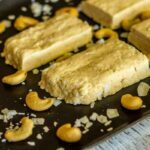 I whip it up quickly in the microwave using this recipe. You can also pre-shred the cauliflower and store it in single servings in the freezer. Then, when you want a serving, just pop it in the microwave or steam it up! Some stores even sell riced cauliflower. I’ve seen it frozen at Trader Joe’s and Green Giant brand is sold in the produce section of Target store. 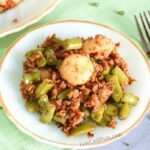 Adding in cauliflower rice really does complete this low carb beef stir-fry. And, it reminds me of the dishes my father used to serve when I was growing up. Things should start to unwind in a couple weeks. I’m really looking forward to the holidays and enjoying my end of the year vacation time away from work. It’s kind of a tradition to take off the last week of the year. Most of my family is local, so I don’t travel. I just like to relax at home during the holidays. How do you like to spend your time celebrating the end of the year holiday season? 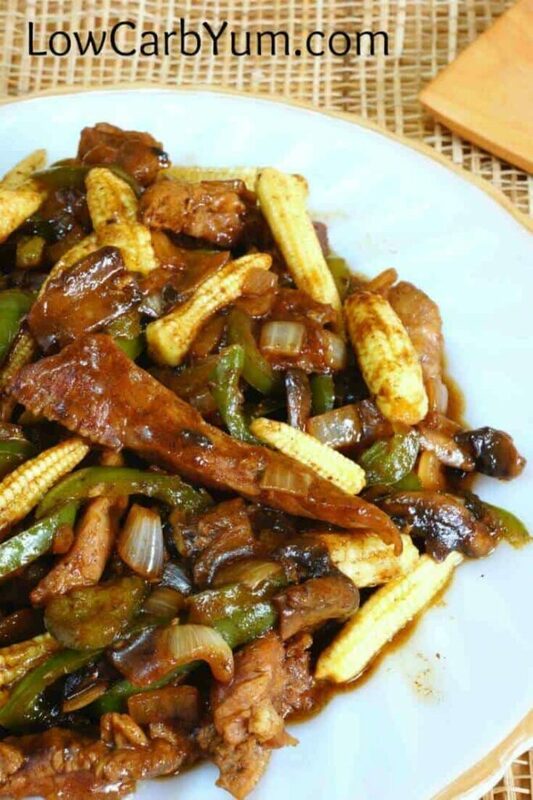 A quick and easy pepper steak beef stir fry dinner with optional baby corn. 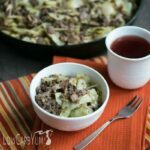 It’s a simple meal that great for busy weeknights. Heat oil in a large skillet or wok over medium-high heat. Add the beef strips and garlic; cook until the beef is browned. Once done, season to taste with salt and pepper, and remove from skillet. Cook pepper and onion in skillet until they are tender. Add the broth, soy sauce, mushrooms, and corn. Cook and stir until until mushrooms are softened. Stir in the beef and continue cooking until heated throughout. 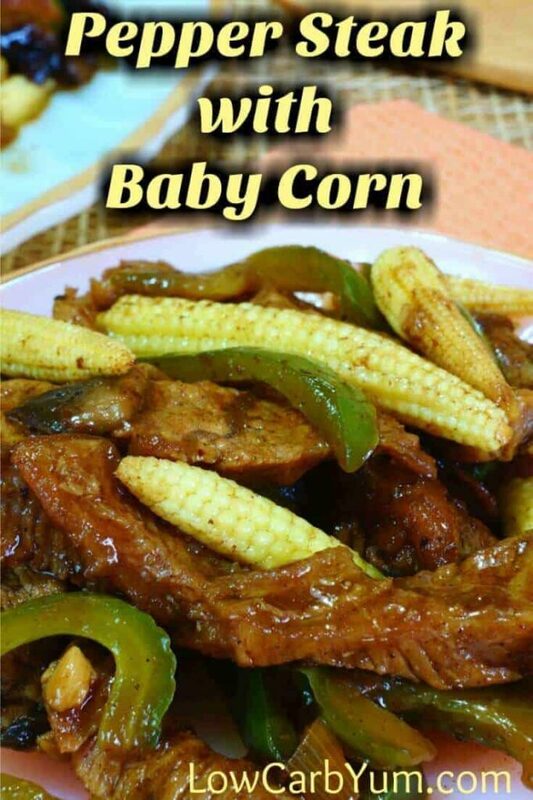 Baby corn will add another 1-2 grams net carbs per serving.